Specialinsert– leading industrial organisation specialised in the production and sale of fastening systems– introduces Deform-Ti, the deformation threaded tubular rivet fully made of titanium alloy where resistance is lightweight and designed for installation on sheet metal and composite panels. The result of a Research & Development oriented business strategy, Deform-Ti emerges from the evolution of one of Specialinsert’s leading products, Deform-Nut, the threaded tubular rivet made of steel, stainless steel and light alloy. With Deform-Ti,the company is introducing a solution able to meet the most stringent industry standards where weight control is as important as the materials’ mechanical strength capacity. Technical laboratory tests on the TC M6/TZ insert demonstrate that the titanium alloy rivet (2.1 g/pc) weighs 40% less than a stainless steel one (3.7 g/pc) and is able to withstand a tensile strength of 25.800 N, 27.80 Nm torsion and 6450 N shear strength. These features combined with high rust resistance ensureDeform-Ti‘s excellent performance, making it the first choice as a partner for the automotive, nautical and chemical industries. Ideal for applications where there is no possible access from the inside such as tubes, metal sheets and box structures, this system is easy and quick to apply. In fact, it is sufficient to insert Deform-Ti in the previously created hole on the material to be fastened and screw in the specific installation tool on the rivet. The tool will then deform the expansion chamber at the top of the insert, anchoring it to the receiving material. Another plusof Deform-Ti is its extreme versatility: it can be mounted on any type of composite material, event thin, starting from a minimum of 0.5 mm, and on finished parts to be used in any production process phase, guaranteeing the utmost design freedom. 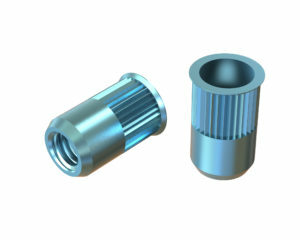 Available in the cylinder version with different shaped heads, with the most popular threading, the titanium alloy rivet, like other Specialinsert ranges, can be customised according to customer needs, guided step by step in the choice and development of the right fastening system for any application by a team of in-house specialists. Pre and post sales service is, indeed, one of Specialinsert’s strengths where technicians and sales agents assist purchasers from the initial inspection to consulting during the assembly phase, also studying custom solutions which, if needed, undergo strength tests and 3D prototyping.